All automotive carpets and floor mats are not created equally. We are proud to offer some of the finest replacement auto/truck carpets available. All of our carpets are made in the USA and every carpet is made to order in your color choice. All Aardvark Motors carpets are made of materials that exceed the OEM (original equipment manufacturer) standards for color retention and light fade resistance. Mass Backing is 1/16" thick latex rubber bonded to the back of the carpet. With the addition of Mass backing, the durability of your molded carpet is improved. Mass Backing adds more shape retention and rigidity to your new carpet. Mass Backing is also a superior sound and heat insulator and will help reduce road noise, exhaust noise, and exhaust heat radiated through the floor. Some new car manufacturers are beginning to use mass backing on their new cars and trucks due to these added benefits. For the best of the best, add our Mass Backing option. See sample photo with edge of mass backing peeled up to the right. Our nylon carpets and floor mats are constructed from 100% first quality Dupont yarn and is dyed using the finest dyes available. The dyes are tested for ozone humidity fading & light fastness to ensure it stays the color it’s supposed to be. The quality of the materials going into our carpets exceeds the OEM standards and will look beautiful for many years to come. All carpets are made to order for your application and color choice. This allows us to offer you more color options than anyone else in the business. Typically, carpets are manufactured and ready to ship in 2-3 business days. Cut Pile carpet has been used in most cars since 1974. Each tuft is separate so if the carpet is snagged it only pulls that tuft out. Cut Pile carpet is typically thicker than loop carpets and is ‘fuzzy’ in appearance. If you have a car, truck, van, or SUV newer than 1974, this is the carpet that came with it. Loop carpet was used in most cars prior to 1974. Loop carpet tufts are made of one continuous thread. Caution should be used when installing a loop style carpet to prevent snags. If loop carpet is snagged, it will pull a straight line out of the carpet. Loop carpet may be used in newer cars but often is not thick enough to conceal the backing on sharp contours found in today’s automotive floor pans. 80/20 Loop is made of fibers that are 80% Rayon and 20% Nylon. Sometimes it’s referred to as Raylon. Nylon loop is 100% Nylon. Many older automotive carpets were cut from patterns and then sewn together. Aardvark Motors takes great pride in being able to offer Cut & Sewn carpets where they were typically used as OE, to keep your classic car as original as possible. 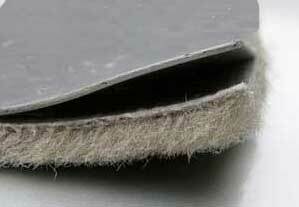 Carpets in most newer vehicles are molded. The carpet is heated & then pressed between 2 floor pan molds. After cooling, the carpet is removed from the mold and shipped. This process creates a ‘memory’ of your floor pan. Once removed from the box, your carpet goes back into the shape of your floor pan.